Jair Bolsonaro emphasizes that his avid support for Israel before being elected was not just a campaign gimmick. President-elect of Brazil Jair Bolsonaro made clear that his election campaign promise to move the Brazilian embassy from Tel Aviv to Jerusalem was not just an empty one. Bolsonaro, a 63-year-old Rio de Janeiro federal deputy and former army captain who ran on the Social Liberal Party ticket, defeated Workers’ Party candidate and former Sao Paulo Mayor Fernando Haddad 55% to 45% in Sunday’s runoff election. During his election campaign, Bolsonaro had promised to close the Palestinian Authority's “embassy” in Brasilia in addition to moving his country’s embassy from Tel Aviv to Jerusalem if elected. 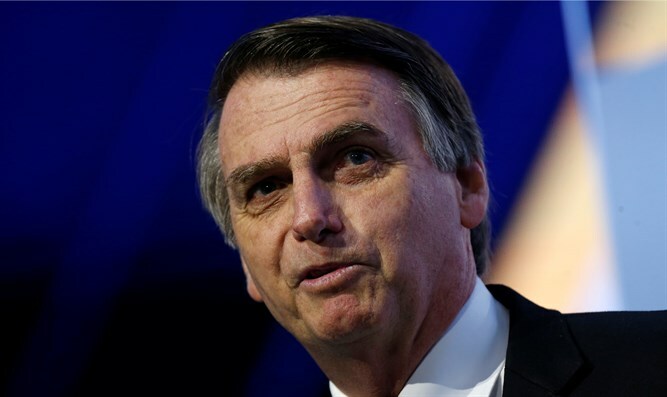 Speaking with Israel Hayom in an interview published Thursday morning, Bolsonaro emphasized that his support for Israel before being elected was not just a campaign gimmick. As for Brazil's stance on matters related to Israel in the UN during his time as president, Bolsonaro said, "You can build on the fact that you have our vote in the UN. I know that many times the vote is almost symbolic, but it helps define the position which the country wants to back. Rest assured, you can rely on our vote at the UN on almost all the matters related to the state of Israel."